Perusing produce at Broadway Market is something of a habitual occupation among a section of the populace, but Ridley Road Market’s British African-Caribbean flavour and carnivalesque scope lends it a markedly different vibe. 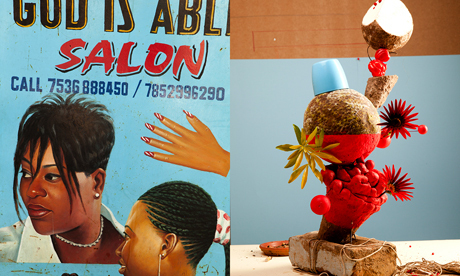 This market, which began life in 1880, evidently fascinates artist Lorenzo Vitturi, who unites sculpture and photography in his series of works A Dalston Anatomy, currently on display at gallery Fishbar in Dalston Lane. There is an atmosphere of constant raucous industriousness in Ridley Road, and Vitturi’s artworks are comprised of and inspired by items like coconuts and pig’s trotters that he has salvaged from this ever busy street like artefacts from an admired civilisation. His book One Pound Have a Look Yam Yam will be released later this year, and the Italian-born artist is creating quite a following. Vitturi says he is interested in ideas about how socialising in a space can radically transform it. One really has to experience the anatomical installations of these market finds to get a sense – and a scent – of what Lorenzo is intimating here. “I went to the butcher stall and found parts of animals that were never used here but are common in Pakistan,” he says. “I rearranged their form and created something beautiful. Lyrically accompanying the collection will be slam poet, Sam Berkson, known for his successful first book Life in Transit, who went to talk to people in the market as part of his research. A series of large format posters and Sam’s poems will be on sale at Fishbar in a publication pack. The exhibition goes beyond the walls of the Fishbar gallery and sets up a stall every Thursday to Saturday for the duration of the exhibition, presenting a temporary installation at a pitch in Ridley Road Market. This is Ridley Road deconstructed, reconstructed, packed full of colour and spice. It is a celebration of curiosity. Gallery open Wednesday to Sunday 11am-7pm and at Ridley Road Market Thursday-Saturday.